Sensei Hoosier was 44 years old when he walked into a karate dojo for the very first time. 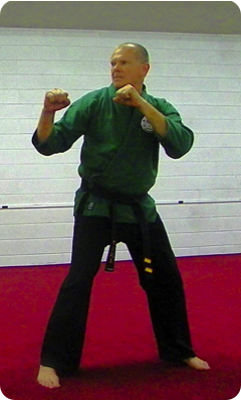 That dojo was in Naples, Florida instructed by Shihan Dave Fox, the karate style was Shito-Ryu, a traditional style that originated in Okinawa by Master Kenwa Mabuni. After moving to North Carolina in 2006, he and his son Alex wanted to continue martial arts training, after a few months of searching for a school that best suited their needs , they decided that Core Martial Arts Academy would be the school for them because they not only taught traditional style kata’s and techniques, but also many practical self-defense techniques. So, in Feb. of 2007, his son Alex started classes there, and he joined just a couple months later in April of 2007. After four years of hard work and devotion, he achieved Sho-Dan (1st degree black belt ), and now enjoys teaching and helping other students obtain their goals.